Director Harris, Elder Reba Dickson, and Director Craft. Sitnasuak Native Corporation (SNC) will begin distributing a heritage dividend and Elder Benefit to eligible beneficiaries of record as of November 14, 2018. Direct deposits are scheduled to be released December 4, and paper checks, for those not signed up for direct deposit, will also be postmarked December 4. When direct deposits and checks arrive will depend on your bank and the postal service. 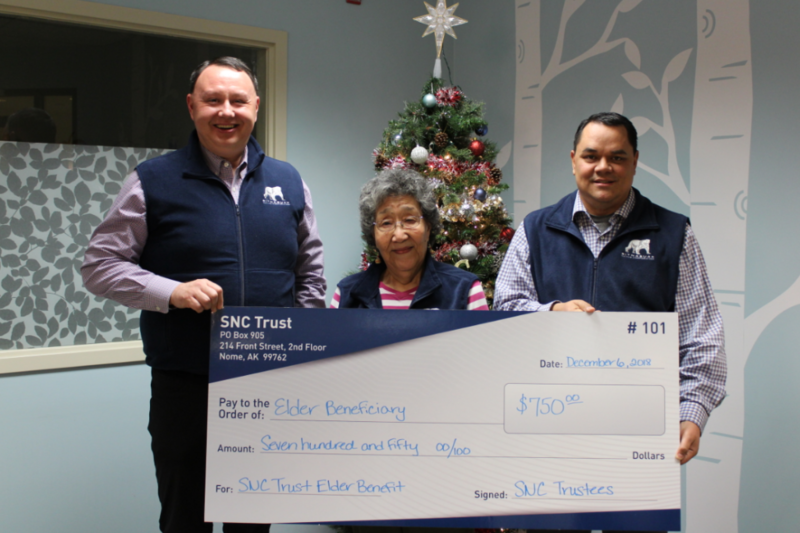 In late November, the trustees of the newly established SNC Trust announced a heritage distribution of $7.50 per trust unit and an Elder Benefit of $750 per Elder, the largest since its inception in 2012. Payments this year will be made through the SNC Trust. The SNC Trust was established following a vote of Shareholders at the 44th Annual Meeting in September with the purpose of promoting the health, education and welfare of the trust’s beneficiaries; preserving the heritage and culture of Alaska Natives; and promoting the long-term economic stability of the trust’s beneficiaries through distributions and benefits and the minimization of taxes. Funding for the trust comes from its earnings and contributions from SNC. It is anticipated that most future distributions to SNC shareholders will be paid through the SNC Trust. An added benefit for distributions through the SNC Trust is the heritage distributions are tax-free to the trust beneficiaries. SNC Shareholders are automatically beneficiaries of the SNC Trust, with the same number of trust units as they have shares in SNC. Accordingly, no further action is required to receive this year’s distributions. If Shareholders are contacted by an individual claiming to be from SNC or the SNC Trust and requesting information to process their distribution, SNC recommends that Shareholders should not provide any information and, instead, should immediately contact the Shareholder Relations Department at 907-387-1200 or toll-free at 1-877-443-2632 or via email at . SNC also encourages Shareholders to visit snc.org/forms to fill out and submit the “Dividend Direct Deposit Form & Slip” to enroll in direct deposit for future dividends. Shareholders who are experiencing any issues or have questions related to this year’s distributions are encouraged to contact the Shareholder Relations Department. SNC is headquartered in Nome, Alaska, with operations in Nome, Anchorage and Wasilla, Alaska, and California, Virginia and Puerto Rico. Sitnasuak’s family of companies and brands includes Bonanza Fuel, Bonanza Express, Fidelity Title Agency of Alaska, Mat-Su Title Agency, Nanuaq, Mocean, SNC Technical Services, Aurora Industries and Sitnasuak Applied Technologies. SNC is one of the Alaska Native village corporations created in 1971 under the Alaska Native Claims Settlement Act (ANCSA). Today, SNC is the largest of 16 village corporations in the Bering Straits region, with over $134 million in annual revenues. SNC is owned by almost 2,900 Alaska Native Shareholders. For additional information on Sitnasuak as well as our business products and services, please visit our website at www.snc.org or like our Facebook page at www.facebook.com/Sitnasuak/.